Dealu Mare Region (or Big Hill) lies on the 45° parallel, sharing the same latitude with Bordeaux and Piedmonte; it is the most compact wine producing region in Romania and considered the original birthplace of the red wines of exceptional quality. The typical warm, dry microclimate and the rather long autumns favours rich grape crop of good quality. There is a long vegetation time of 210-240 days with a maximum humidity of 55-80%. The soils are brown-reddish forest with a high content of iron, which is very favourable for the red grapes. A balanced full bodied red wine. Garnet red in color, the wine is dominated by fine notes of red fruits and vanilla. 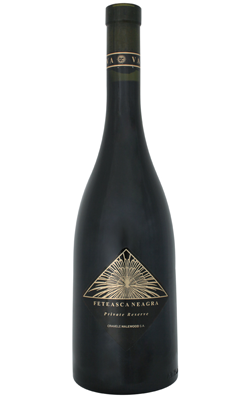 It presents an intense bouquet of spices, almonds and prunes, complemented by a rich structure and fine tannins. The bottle aging gives a pleasant and memorable aroma. Enjoy at room temperature with poultry, lamb or cheese.